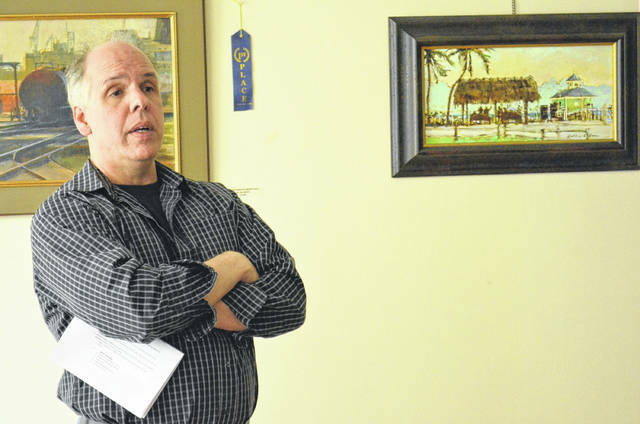 Dan Knepper (pictured) and his son Jordan Knepper advised area artists on how they can improve their artwork and move up their artistic careers along during a presentation Thursday at Riverside Art Center in Wapakoneta. Dan Knepper is an artist with work shown in six galleries across the nation. Jordan Knepper is the executive director of Piqua Arts Council and a juror for regional art exhibitions. WAPAKONETA — Area artists gathered at Riverside Art Center Thursday to learn how to move through the different levels of the art world. Dan Knepper, an artist with work shown in six galleries across the U.S. and over 25 years of experience as an art educator, and his son Jordan Knepper, executive director of Piqua Arts Council and often a juror at regional art exhibitions, gave a presentation entitled “Peeling The Onion: How to Advance Your Art Career.” An apt name because, as the two men explained, advancing an art career is very much like peeling an onion. Jordan Knepper said there are six layers to the art world: local, regional, state, sub-national, national and international. The key to moving through the levels is learning about the elements and principals of design and building a brand and style, he said. Beginning and intermediate artists can start showing their work locally at libraries, cafes and even pay galleries. “It’s a good place to start, though,” Dan Knepper said. Local competitions tend to only draw in artists from the surrounding county to compete, Jordan Knepper said. The level of quality is usually beginning level art with some intermediate skill level. To move from the local level to regional the artist needs to begin studying elements and principals of design and incorporating them into their artwork — things like the rule of thirds, perspective and other advance techniques, he said. The key to moving from regional to state work is to begin developing the mastery with your medium, Jordan Knepper said. Artists should also begin developing an understanding of how frames and matting effect judging in competitions and sales as they move into the state level and up. Having low-quality frames and improper matting can effect judging and pricing, he said. When an artist reaches the point they want to move into the state level and up is when they need to begin to consider portraying emotion in their work and a brand, Jordan Knepper said. Dan and Jordan Knepper both emphasized the importance of making friends with other artists and having artists with high skill levels critique their work. “Take workshops from the bests artists available to you,” said Jordan Knepper as another way to improve skills. Dan Knepper said while their presentation was advice on how to move up through the levels of painting, their advice can be tweaked for advancing with other artwork.